Trudy James' playful necklace will inspire you to find cat-and-yarn levels of joy in your life. We should all find as much joy in something as a cat does in a ball of yarn. Wear this necklace to inspire you to do just that (find joy, that is, not bat around some yarn). 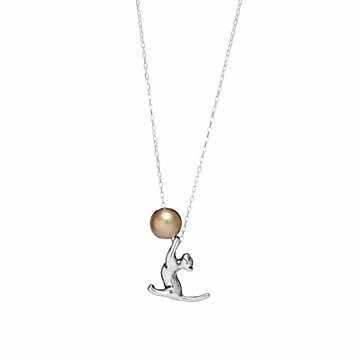 Trudy James pairs a sterling silver kitty with a 14k gold-fill ball to create a playful accessory that will delight anyone who fancies felines. 18-inch sterling silver chain. Handmade in California. Pendant: .6" L x .6" W Chain: 18"
Wipe down with anti tarnish cloth.